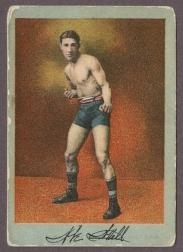 DeansCards.com just received one of the rarest boxing sets that we have ever encountered. The 1910 T225 Prizefighters boxing card set consists of 50 cards that measure 1⅞” by 2 ⅝” and feature the most prominent boxers of the time. The set was released in two series of 25 cards each and organized alphabetically by the boxers’ last names within each series. Currently, we have the first series in stock. The set was probably released over a series of two years (1910-1911) and could be purchased by sending $1.00 to the manufacturer, as stated on the back of the card. All 50 cards would have been mounted on a piece of parchment and then placed in a frame. A few examples of the framed set still survive today, though many of them have experienced significant damage in their 100 years of existence. These cards are a good example of the booming tobacco business in the early part of the 20th century. 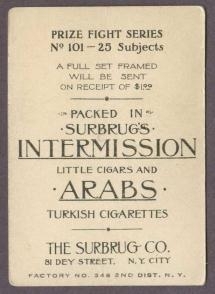 The Subrug Company out of New York City produced the cards to be sold with their Intermission Little Cigars and the Arab’s Turkish Cigarettes. An advertisement for these two products is printed on the back of each card. The Subrug Company was purchased by the Khedival Company, a larger tobacco manufacturer, in 1912, right after the T225 boxing card set was already printed. Therefore, these cards are often referred to as the Khedival boxing card set, although that company’s name never appears on the card. The boxers featured in series one are some of the most interesting characters in all of the sports world, especially when one considers just how popular boxing was at the time these were printed. One of the most famous boxers in the set is Stanley Ketchel, who is still considered by many to be the best middleweight boxer ever. Ketchel was famous for fighting heavyweights, who would have outweighed him by at least 30 pounds. He was eventually murdered in a robbery after his most famous bout, a 12 round fight against Jack Johnson. Also featured in this set is Abe Attell, who was implicated in the Black Sox scandal of 1919. Attell had befriended Arnold Rothstein, a New York-based gambler, and allegedly connected him with several White Sox players. Rounding out this set are the twin brothers Jack and Mike Sullivan. They were both known by their nicknames, which happened to be “Twin” for both of them. These unique cards have some of the richest history for any sports memorabilia and we hope to learn more about all boxing cards in the future.